Philomena Meechan, LSA Language Resource Center, and Todd Austin, LSA Instructional Support Services, recently presented with Professor Alexander Knysh, U-M Near Eastern Studies, and faculty from St. Petersburg State University, Russia at the SUNY COIL conference in New York and at the UNICollaboration Conference in Kraków, Poland. Their presentation showcased how two Near Eastern Studies courses used a combination of BlueJeans videoconferencing and shared Google folders as core online communication tools to carry out collaborative projects and to learn about each other’s language and culture. 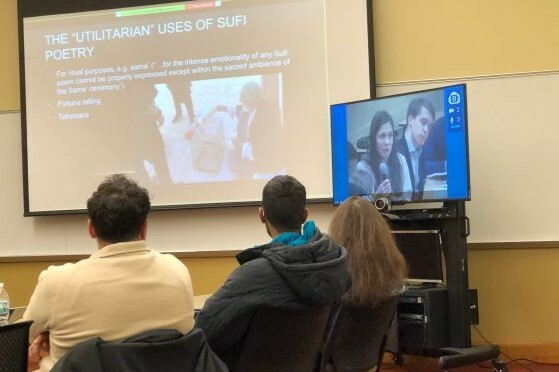 Meechan and Austin are LSA consultants who have provided instructional and technical support for more than 30 U-M courses across multiple U-M units and campuses where videoconferencing technology is used to connect U-M courses with international partner students and faculty. Read their full report.